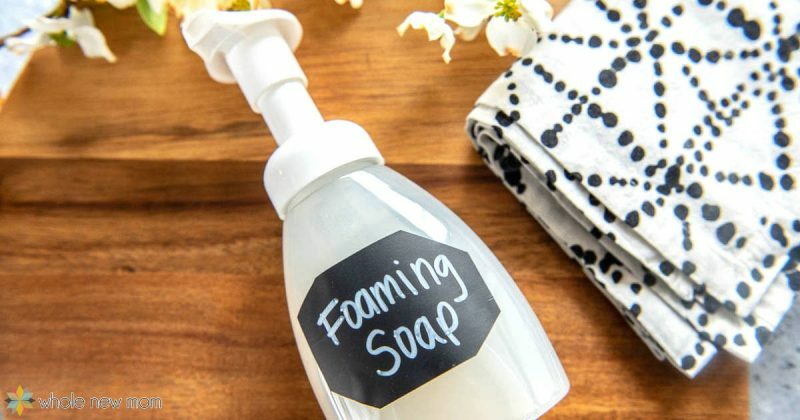 This Homemade Foaming Hand Soap is one of the easiest ways to create a greener and healthier you. 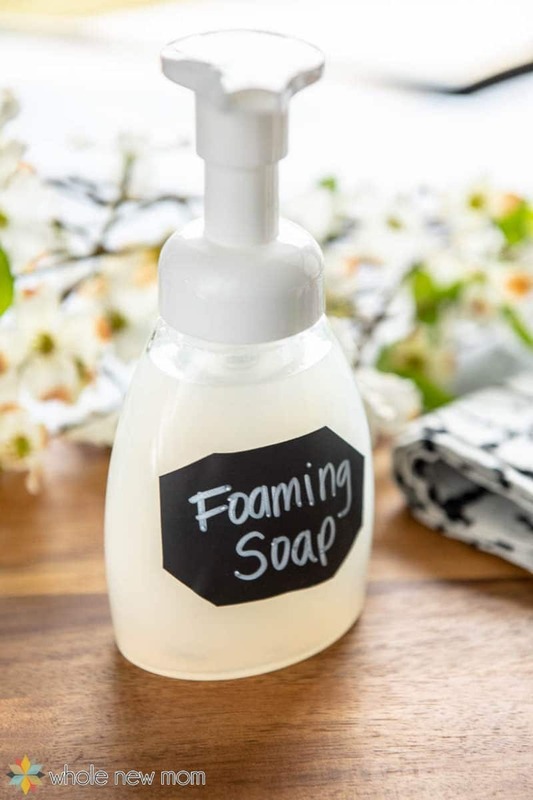 This foaming soap is simple to make, inexpensive, and it works really well–and is, of course, fun for kids (of all ages) to use! 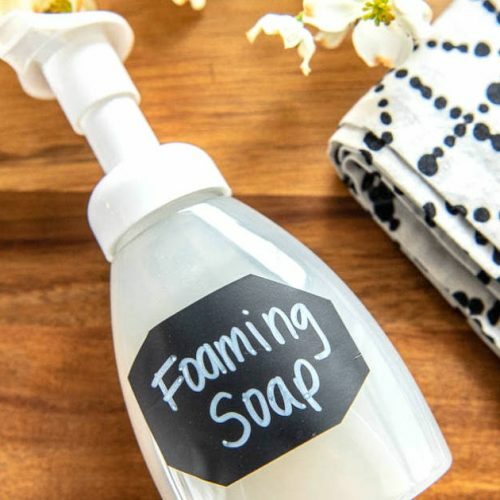 Why make your own homemade foaming hand soap? tired of refilling your soap pump containers over and over again thinking of the amount of money you are literally tossing down the sink? spending a lot of money purchasing foaming soap containers over and over again? frustrated with the goopy mess that standard soap pump soap leaves on your hands that sometimes isn't gone even after washing? Then I highly recommend that you consider making this soap now. I am always motivated to save money while avoiding synthetics and toxins as much as possible, as long as I don't have to spend too much time doing it. 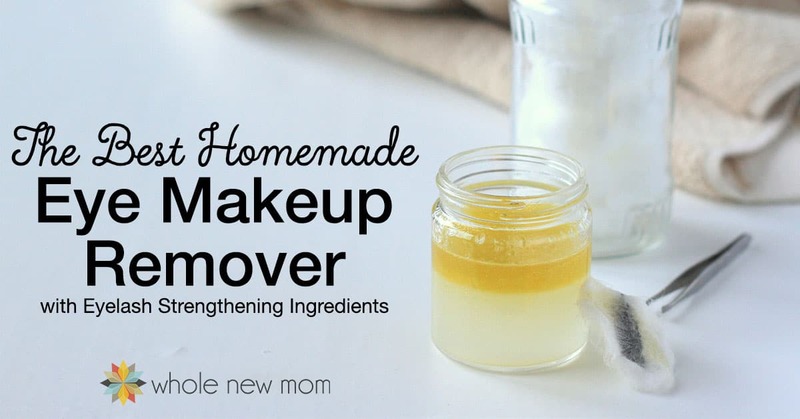 This motivation has led me to make my own Homemade Shower Cleaner, DIY Lip Scrub, Homemade Hairspray, DIY Chest Rub, and more. And you will be happy to know that it is EASY. First, add water to the foaming pump container. 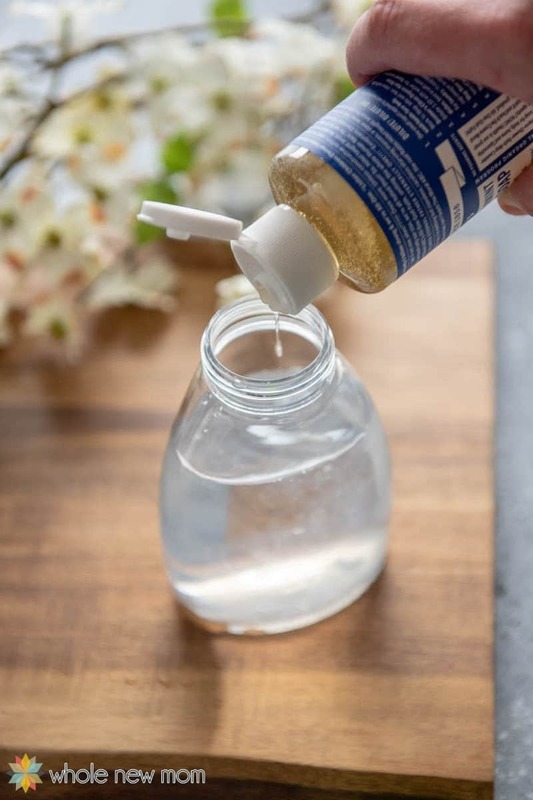 Add castile soap to the water–not the other way around! Why Is Glycerin in this Homemade Foaming Hand Soap? Glycerine adds a number of benefits to this homemade foaming soap. The glycerin makes for a smoother, thicker soap which is much nicer to pump and use than thin, runny foaming soaps. Actually you would need 50% glycerine for this soap to truly be preserved, but it's good to know that glycerine does add some preservative properties to this homemade foaming hand soap. Don't Eat the Soap, but…..
One thing you might not know, is that vegetable glycerine is not only great for adding moisturizing qualities to this homemade foaming soap, but it's also a great sweetener alternative for those trying to consume fewer carbs. 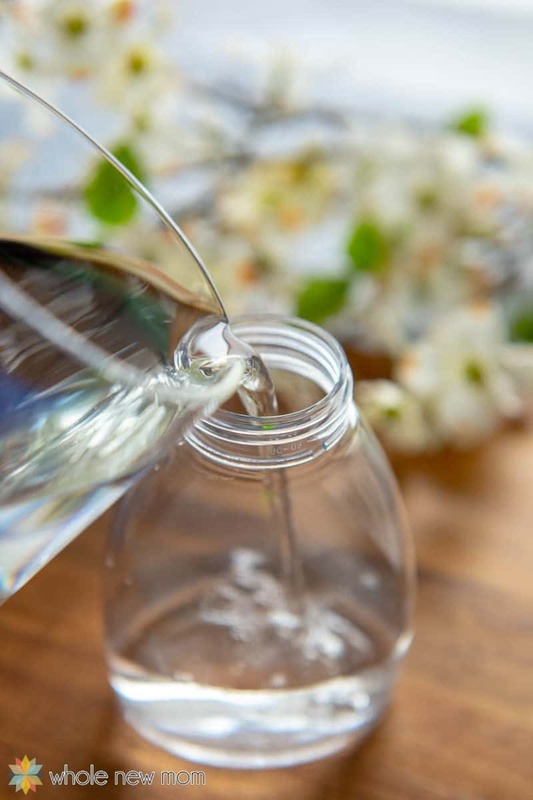 In most cases, you can use whatever glycerine you like for sweetening as well as for use in personal care products, but you might want to ask the manufacturer. Actually, the ingredients in this foaming soap are so non toxic, you really don't have to worry if some gets in your mouth, but still I wouldn't go around making it a habit of eating it. There are many places that you can buy vegetable glycerine. 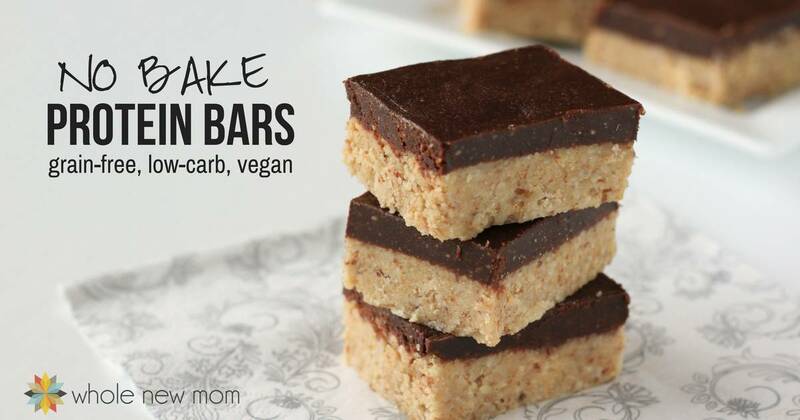 You should be able to find it in a drugstore or nutrition store, but almost definitely in a health food store. If you'd prefer to buy it online, you can find it on Amazon and also at Starwest Botanicals. What Dispenser Should I Use for this Homemade Foaming Hand Soap? Finding a good quality dispenser for this soap is a little tough. I have had multiple quality issues with some soap pumps and tried about 4 different kinds. One brand that kept breaking was the Pampered Chef version and the other was a Cuisipro. The Pampered Chef design appears to be unchanged, but the Cuisipro is certainly new. Those who would like a pump without a label on your soap dispenser may wish to try those. A reader commented that she loves the dispenser from this product and she simply removes the label off of the bottle after emptying it out. I would think that one would have to clean the bottle and pump out really well to get the residual scent out of it but otherwise it looks like a great option! Fill empty foaming soap dispenser with water, approximately 4/5 full. Fill remaining space with a liquid soap of your choice (and glycerine and essential oils, if using) being careful not to get too close to the top. Shake gently to mix and use. Note: you definitely do not want to add the soap first. If you do, the soap will foam up as you are adding the water to fill the container and you will end up with a foaming, half-filled container. 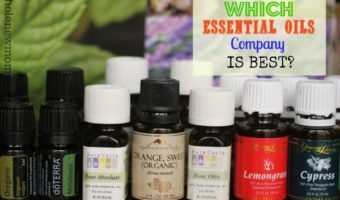 If you are wondering which essential oil to use, citrus oils like lemon or orange are wonderful! So there you have it–simple, isn't it? 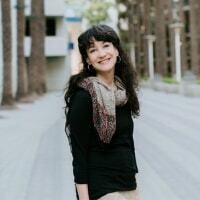 Very little work for a lot of money saved and better health for your family. You can easily reduce the toxic exposure in your home and you have a bit more of your financial resources available to address your family's needs and to bless others. 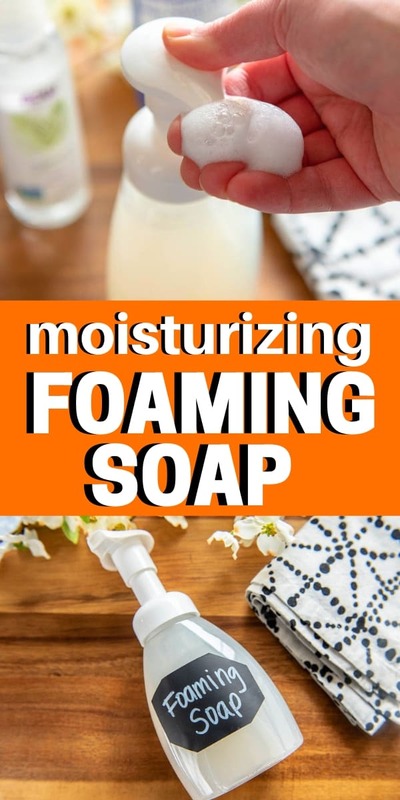 Have you made DIY Foaming Soap before? 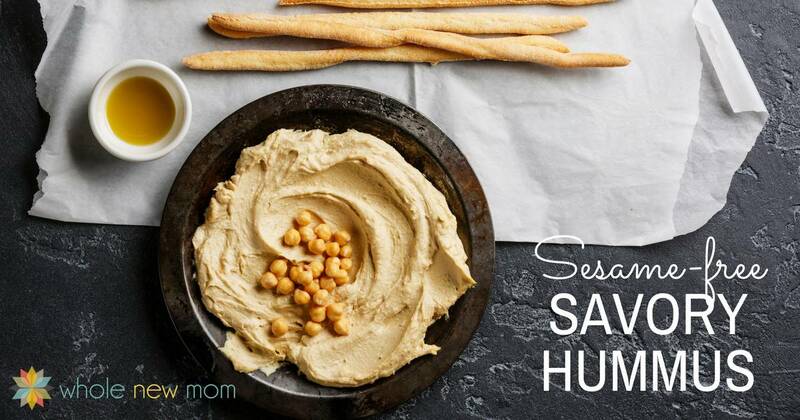 If not, will you try it? In my experience, hands down, the absolute best foaming soap pump dispenser that produces the best density suds and has the best life expectancy regarding breakage of the pump mechanism is not sold as a hand soap dispenser at all. 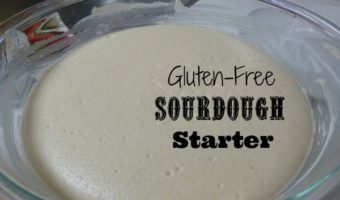 It is the dipenser for a “fake latte foam” product called “Sebastian’s Barista Cafe Flavored Latte Foam Coffee Topping” that can be found in the coffee aisle at Walmart (though one could probably find it on Amazon as well). I bought it to try it out in my coffee since it is dairy & sugar free….but the taste was horrible & full of fake sugars and bad ingredients. At that time, my foam soap dispenser had just broken. So on a whim I cleaned out the “Flavored Latte Foam” dispenser, removed the outer plastic wrapping that contained the name and picture of the product so my hand soap didn’t say “latte foam for your coffee”, and filled it up with DYI foaming soap ingredients. Perfection. Smooth, never watery, perfect foam density every time. It works like a champ and hasn’t died in going on 2 years. When the plastic label is removed, the dispenser itself is simply opaque white plastic which can be decorated, drawn or painted on. 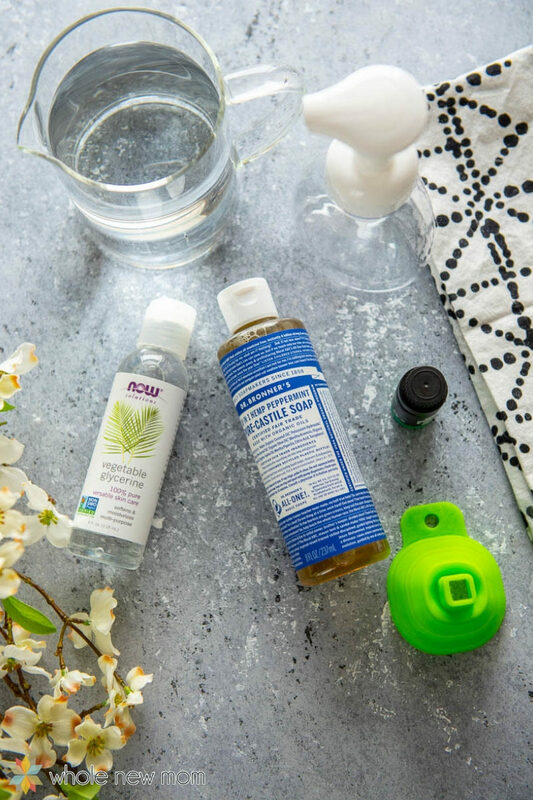 There are several anti-bacterial essential oils that can be added for a more “anti-bacterial” soap such as Oregano Oil, Tea Tree Oil, & Eucalyptus. Neem oil is also anti-bacterial but it has an awfully pungent odor that reminds me of stale peanut butter. It is also more of a carrier oil than an essential oil so it could be used as a replacement for ingredients using moisturizing additives like the glycerine. 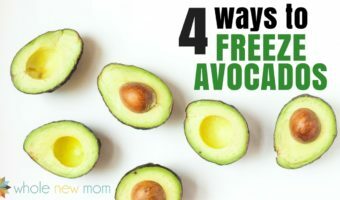 Or canserve as a replacement for the oil in other DIY moisturizing foaming soap recipes that use oils like avocado & olive oil instead of glycerine. (I have not personally used been oil in a soap recipe because the smell of Neem Oil is hard for me to tolerate. So interesting! Had you tried other pumps as well? And yes, neem is unusual in its smell for sure! I am worried about the bacterial growth. It is going to last at least 2weeks to use the foaming soap up even I make a small batch. Any suggestions? I like the feeling to wash my hands with castile soap, but I have no idea how much bacteria will grow when it is added with water. Hi there. I just asked a skincare expert who said it shouldn’t be a problem and that the pH of the soap should keep microbes at bay. I can’t vouch for this since I don’t have that expertise but hopefully this is the case. 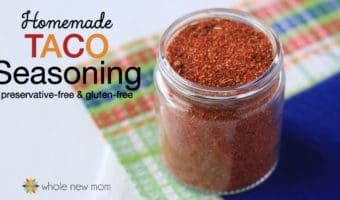 I would clean the container out really well each time you use it. Thanks for reading! Hi, thanks for this! 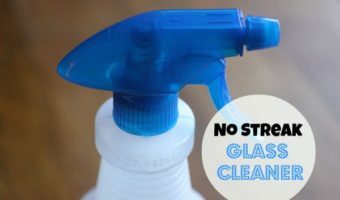 Do you use solid or liquid glycerin? Solid would be a soap made with glycerin, correct? You use liquid which is linked to in the post. Thanks for reading! Where do you buy glycerine? Hi Jean! There is some information in the post about that–what stores would carry it and online options too–let me know if you can’t find it! It means 50% of the formula would need to be glycerin.